Our Most Popular Metal Mobiles... Full Size, Minis and Fades. The Feather mobiles are our most popular Metal Mobiles. They are made with Aluminum armatures and brushed and formed aluminum vanes. The vanes are riveted to the arms with Aircraft rivets. We texture the surface of the vanes in a circular brushed motion and either leave the surface as brushed Copper or brushed Aluminum. We also colorize them with semi transparent spray and finally a seal coat Satin clear. The mobile is then tied and hand balanced and packed carefully ready to hang up. No assembly is required. For interiors. All are signed and dated by Joel Hotchkiss. 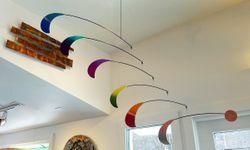 The Feather FADE Mobiles each feature 2 separate colors that fade into each other on each of the vanes of the mobile. The effect adds depth and interest to the mobile. Signed and dated by Joel Hotchkiss.